I recently looked back over my 2012 "Feeds and Drains" list, a list of the various people and events which energized me or depleted me. I thought "Wow, that was a tough year – I wonder if I was jinxed?" Why did I think this? My 2012 list, like all prior ones, had more "Feeds" than "Drains." What was different this year – my ratio of "Feeds" to "Drains" was the lowest it had ever been. Indeed, several times during 2012, I thought I was jinxed – times when two or three or even more unpleasant surprises would hit me within a few days. On one of these occasions, I just had to laugh – I realized my work life seemed like an episode of The Office ... only more absurd. Fortunately, I don't believe in jinxes. I do, however, realize how many things in life happen over which I have no control. How does all this relate to Personal Accountability? Keep reading. First, though, I need to describe three events from 2012. As you read these, ask yourself, "Were these events uncontrollable?" I had cruised along very nicely in "Todd's Results" for many years until ... September 2012, one month where I had several rapid-fire unwelcome surprises. These surprises were ALL urgent AND important. How to handle such events? Give them the HIGHEST priority, and address them IMMEDIATELY. So I did just that. When I met with my Accountability Partners to go over my results for September, one was uncomfortable signing off on my completion of all goals for the month. While she acknowledged I had kept her in the loop during the month and I had done everything I could have done, her discomfort remained for a simple reason – I truly had NOT completed all my tasks for the month. Her discomfort became my panic when she proposed giving me a "Red X" for the month. Initially, this seemed to be a BIG deal. Why? Because, for nearly seven years, I had NEVER failed to meet my monthly goals! We devised a compromise – a "Yellow Check Mark" – to preserve the integrity of her sign off and the importance of monthly goals, while also reflecting the whirlwind unexpected changes in circumstances. In 2012, I had two staff resignations – and both came completely out of the blue! I had no indication to think either was coming, because both staff were doing their jobs very well and seemed content. The one commonality - both staff resigned to pursue opportunities more in tune with their personal longings. One person went straight into a new position, and the other left to try various careers which had been in the back of her mind quite some time. Needless to say, a resignation is ALWAYS a big thing, especially in a small firm like mine. Nonetheless, it has happened many times before, and I now recognize the typical pattern - someone comes to my office, asks if I have a few minutes, closes the door, sits down, and pulls out an envelope to give to me. Once the door closes, I am 90% certain I know what's coming, and my certainty jumps to 100% once I see even the tiniest corner of an envelope. Interestingly, just seeing the pattern begin to play out gives me a few moments to mentally prepare for what's coming, so I can calmly respond to what's coming. Accountability Lesson? With all resignations, including these two, work still needs to get done - clients served, projects billed, staff paid. Ultimately, I am accountable for getting essential tasks done. I do this by immediately divvying up tasks in the short term, while also evaluating my longer-term options and quickly putting my best option into action. I've been fortunate – for over 22 years, my staff and I have always come through for our clients, even when the going was tough! In 2012, we had a project start off reasonably smoothly, and then a hiccup occurred, and then another one right behind it. The result? We lost traction on the project and never quite got it back. We ended up making things right with the client – still, I did not feel good about this experience, and I wondered how my staff felt. In early January, I put this issue to the group in our monthly "Project Roundtable." I did so with a little trepidation – I was wondering, "What if they don't feel the same way I do?" and "What if the discussion gets out of hand?" Fortunately, I had absolutely no reason to worry. Midway through the meeting, one staff person said, "We are not a firm where 'good enough' is the expectation – that's not the way we do things here" – and EVERYONE immediately agreed with him! Accountability Lesson? I cannot control every detail on every project. Many are inherently uncontrollable – a person's thoughts and actions, a previously undiscovered software limitation, or an unprecedented series of unfortunate events for multiple staff members. Things like these cannot be controlled. Still, I can analyze outcomes, learn lessons, and apply these to future projects. With three examples, I've covered both familiar experiences and new ones, big things and small things. So what did I learn from these three events? Well, there were many specific "lessons learned" from each experience. Yet, this article is about Personal Accountability – what did I learn about that? What I learned is this – the process I followed in each instance worked quite well. Here's how I handled these uncontrollables while practicing Personal Accountability. Everyone knows some variation of the "things happen" truism – "stuff happens" is one, among many others. Why do things happen? Because the only thing I can control in life is me. I can't control other people – whether one of my staff stays or leaves, how well or poorly a client collaborates with us, or the smoothness or bumpiness of peoples' personal lives. I can't control environmental factors – severe weather, power outages, the overall culture of a company or community. I can only control me – period. Trying to control anything else? Pointless. While it is possible to influence someone or something, control is impossible. I learned this lesson in a recorded teaching talk by Tara Brach, a Buddhist meditation teacher in the Washington, DC area. The lesson is simple, yet profound. Good things and bad things happen to everyone – no secret there. The trick is to fully experience an event, then let it go as quickly as possible. In my three examples, I did just that. First, I fully experienced the experience – my panic about a potential "Red X," my shock about a resignation, and my bewilderment over a problem-plagued project. Second, I let the emotion go as quickly as possible. Panic turned into a resolution to laugh at myself for sweating a small thing like a "Yellow Check Mark," and to write a self-deprecating Ah-Ha Moment! about this. Shock was replaced by a laser-like focus to adapt to the new circumstance and to find ways to continue getting things done. Bewilderment gave way to acceptance many times on a project where my staff and I resolved one issue, only to find another, and then have the whole cycle start all over. As Tara teaches, it's not possible to AVOID an emotional response – rather, the goal is to fully experience the emotional response as quickly as possible, and then move on. I visualize the lesson like this. Imagine you're holding a bucket. An empty bucket reflects your day-to-day state of being – how you are at work or with family, when things are normal. Then someone or something disrupts this state – a gallon of water is thrown into your bucket. Your goal? To pour the water out as quickly as possible, and return to your "empty bucket" state of being - calm, attentive, relaxed, and able to appropriately respond to changed circumstances. 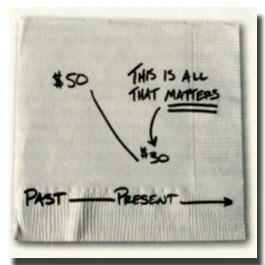 Carl is a financial adviser who uses doodles like this one to help clients understand his points. An investment starts out at $50 and, because of events beyond the investor's control, is now worth $30. The $30 is the here-and-now present reality. Clearly seeing this is a necessity, because investor and adviser can then begin to look for options to move forward. The same lesson applies in all parts of life – the past cannot be changed, and the present provides your only opportunity to act. Assess options in the new reality. "Act" to correct differences between actual and planned results. After the PDCA cycle is completed, the change will be implemented. This can be done in manufacturing, drug trials, and similar situations where an experiment can be defined and conducted. "Adjust" your plan to real-world circumstances. Not as tidy as a lab experiment – yet, did anyone say life would always be tidy? One benefit of an Accountability Partner? Third party objectivity. One downside of an Accountability Partner? Third party objectivity ... yet sometimes this viewpoint is exactly what's needed. In my three examples, my Accountability Partner helped me most in the two "Big Thing" issues. I frequently found her comments annoying – the truth can hurt, even when delivered kindly. Still, her observations always accurately reflected reality. Without them, I would have taken longer to get back to my "Empty Bucket" state. Denying reality or dwelling in the past only prolongs the inevitable need to move forward. Indeed, forward movement is the real benefit of an Accountability Partner. Keep in mind this WILL be a love-hate relationship. While you will LOVE the eventual forward movement, you will frequently HATE the process to get there, especially when this person deliberately provokes you to take action, or bats away all your lame excuses for not getting something done ... now! How does all this relate to Personal Accountability? Remember, the person in Personal Accountability is "me." Even though an Accountability Partner can help, "I" am the person ultimately responsible. Perhaps all this sounds a little self-focused – that's unavoidable. Personal Accountability is not about anyone or anything else – it is all about "I" and "me." Personal Accountability is mine to choose, or not. It is mine to practice, or not. Anything else makes it about others. And anything about others, even a smidgen, is not truly Personal Accountability. Blaming, complaining, rationalizing, or procrastinating – all are mechanisms to temporarily cover over reality and avoid accountability. Why do we do this? Human nature makes us want to avoid looking sheepish, appearing imperfect, or seeming to not be in control. Uncontrollables are everywhere. Personal Accountability should be, too.